According to my very unofficial Twitter analysis, everyone wants China's Olympic swimmer Fu Yuanhui to be their new best friend. Can you blame them? The 20-year-old Chinese athlete captured more than just a bronze medal when she tied Canada's Kylie Masse for third in the women's 100-meter backstroke earlier in the week. Her refreshing candor and animated facial expressions endeared Yuanhui to Olympic spectators around the globe. She may just be one of the most enjoyable athletes to watch in Rio. But who is this Olympic swimmer? Yuanhui quickly skyrocketed to internet fame after she learned on air from a reporter that she'd qualified for the women's 100-meter backstroke final by placing third — and not fourth as she'd thought — in the event's semifinals. Although still trying to catch her breath, Yuanhui could hardly contain her joy and excitement upon hearing the news. Born in Hangzhou, the capital city of China's Zhejiang province, Yuanhui was reportedly introduced to the sport of swimming by her parents when she was just 5 years old in hopes it would help her overcome asthma, the Associated Press reported. She was later invited to join the municipal swimming team and at age 16 qualified to compete in the 2012 London Games. While Yuanhui may not have medaled in the London Games — she reportedly finished eighth overall in the women's 100-meter backstroke — but her swimming career was only just getting started. She finished second in the 50-meter backstroke at the 2013 FINA World Championship and returned to the competition in 2015 to take home gold medals in both the 50-meter backstroke and the 4x100-meter medley relay team. Perhaps what makes Yuanhui so well-loved isn't just that she's the most GIF-worthy swimmer competing in Rio right now, but that she's refreshingly honest about the amount of hard work it has taken her to reach the Olympic level. 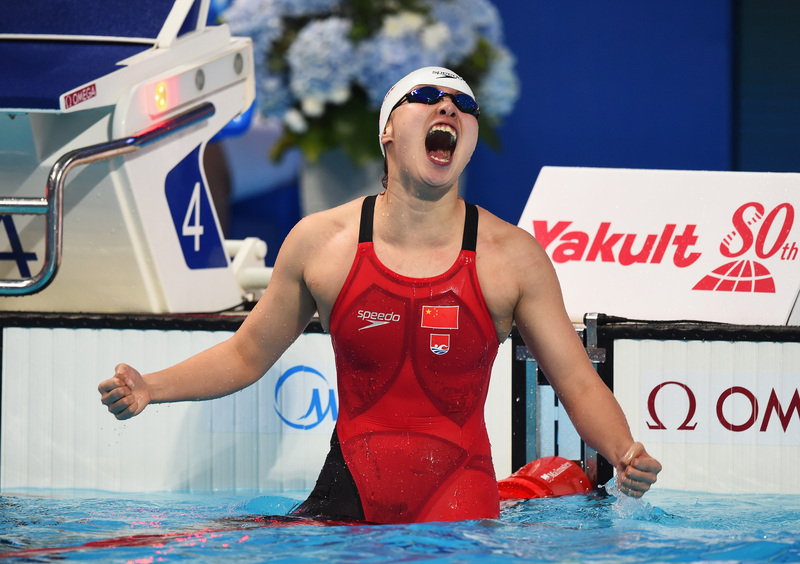 "I know what I've endured," she told China's Propeller TV after qualifying for the 100-meter backstroke final. "It's truly been so hard. I really felt as if I wouldn't make it. At times I felt like living was no better than death, but I'm so pleased with today's result." Now 20, the two-time Olympic swimmer seems to be wise beyond her years with an extraordinary outlook on life. "I know for what I live," the AP reported Yuanhui said in a post published on her official social media account back in January. "I know the kind of life I want. It's simple. Joy. Loving Heart. Gratitude. This is what I want. Being outstanding or not, it does not matter."